My brother has been in Italy looking into necessary paperwork for inheriting a house. While that has been going on, he took a trip up to Schwäbisch Hall in Germany to say hello to some friends and while he was there, he passed through a couple farmer’s markets. Being my brother, he looked for, and found some great cheese and sent photos! Now I want to share my brother’s cheese with all of you and take you on an adventure through this German cheese. Schwabisch Hall, in the Kocher valley, is set between the Hohenlohe plain to the north and the Schwabisch Alb moutain range to the south. With such an interconnection between the names of both geographical and political features, it becomes apparent that a strong “sense of place” has developed within Germany. As a sense of place becomes part of the tradition of a region of people (or perhaps it’s the other way around) it seems inevitable that food becomes part of that tradition. Methods of preparing certain foods and meals, certain foods grown, animals bred and kept on farms – over time, the landscape, weather, climate, geology will dictate what local and unique foodstuffs will thrive in an area. 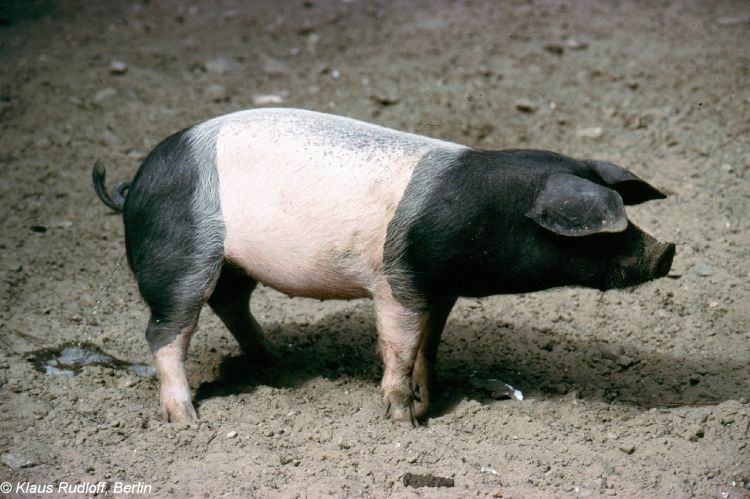 For example, the Schwäbisch Hall region is very well known for their Schwäbisch swine – a pig that is only bred and raised in the 573.00 sq. 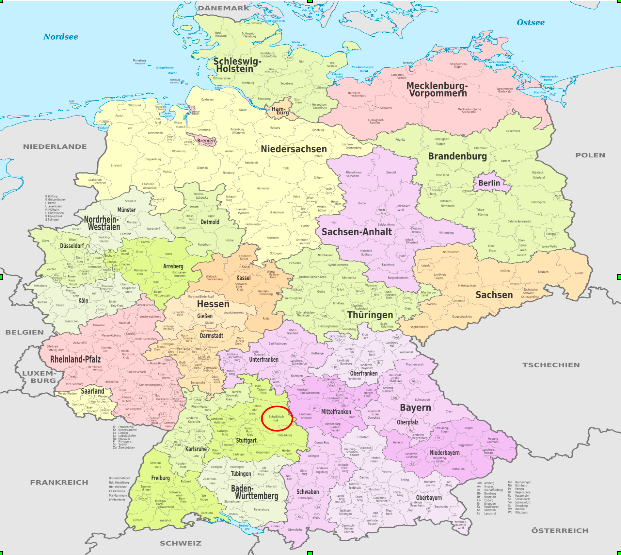 mi area of Schwäbisch Hall. 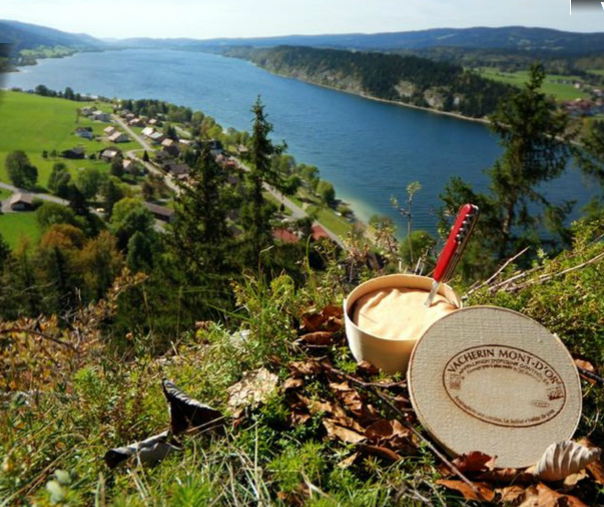 Because the location of an area is so important to the cultural food identity of a place, I want to begin to get to know the farmer’s market cheese from Schwäbisch Hall through knowing the landscape of the district. The geographical area gives an idea of the weather patterns and vegetation. 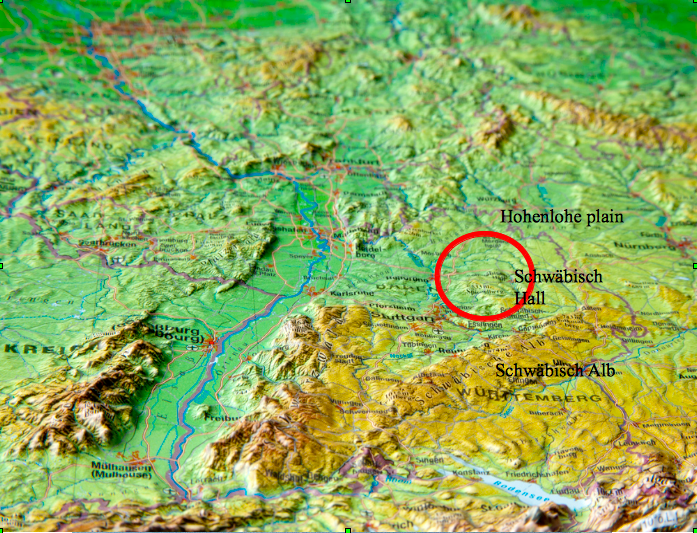 Settled in a valley with the strong Neckar river, the Schwabian alb range to the south and the Hohenlohe plain to the northeast, the Schwabish hall region encompasses a wide variety of elevations and soil types. This gives way to a variety of vegetation – food for cows when grazing out in pastures or among the foothills. This vegetation varies in water content and minerals present, affects milk composition which in turn affects the flavors of the cheese. The Hohenlohe plain (Hohenloher Ebene) and the Swabian-Franconian forest hills are dotted with small sedge communities, spring swamps, woodland spring mires, and lots of trees. It is actually at the intersect of subalpine-boreal, frost-sensitive atlantic and sub-mediterranean biomes, which means that spring water remains rather cool in the warmer parts of the year and during the cold months is relatively warm and never freezes. The geology of the Kocher valley is predominantly of non-metamorphic calcareous sedimentary rock. Calcium and magnesium observed in the water (making this area one that has “hard” water). This is an interesting note because an abundance of calcium present in streams and vegetation definitely makes its way into the cow’s diet and can affect the cheese. The weather, geography, vegetation, and geology of the area all contribute to “sense of place” a familiarity with a locale and all of which play a big role in cheese production and taste. These factors set the stage and provide the fundamental parts of cheese make procedure and give us a better idea from where this cheese is coming. 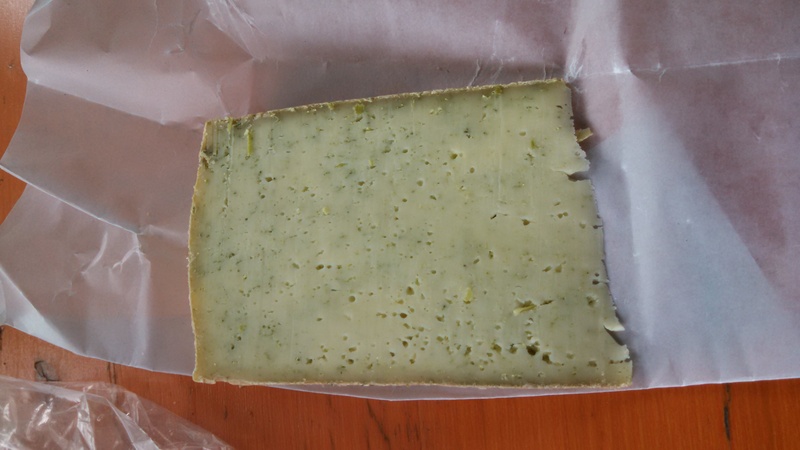 Next time you buy cheese, ask yourself – is this from Vermont? Italy? Denmark? Wisconsin? What is the weather like there? the geography? And taste the cheese. Allow yourself to experience the sense of place through taste – tasting the mineral-laden soil, the cool spring waters, the damp, wooded forests – because all of that plays a part in taste and experience. 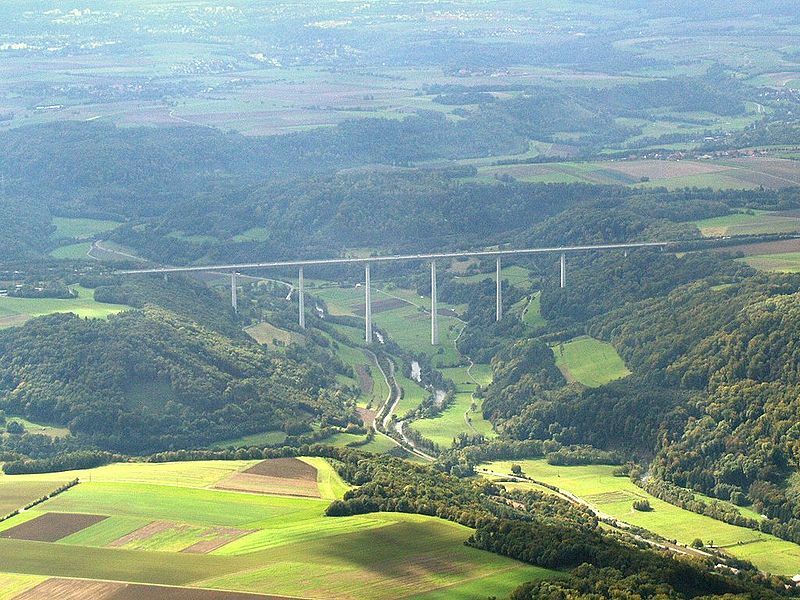 A gorgeous photo of the Kocher valley (and also the tallest automotive bridge) but seriously, wouldn’t you want to know that the cows that produce the milk to make the cheese you eat are grazing in this valley?? Categories: Cheese Profile | Tags: cheese, climate, geology, German, Germany, Schwäbisch Hall, sense of place, soil, Swabisch Hall, vegetation | Permalink.